Discover the exclusive private collectors of Malaysian art from four prolific art collectors. By Zena Khan. Styled by Emmilyn Yeoh. Art direction by Teng Siew Lee. Photographed by Ian Wong. 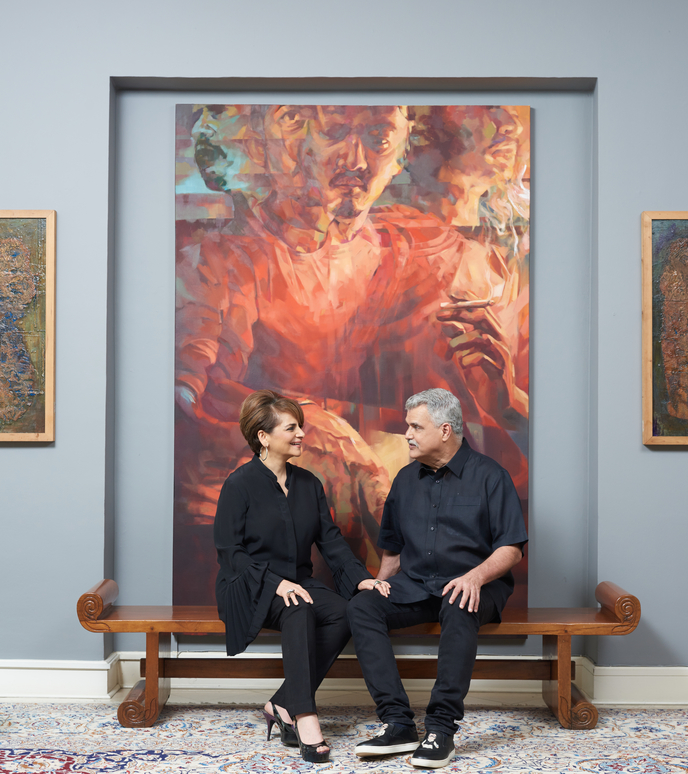 Presenting four of Malaysia’s top private collectors and their dynamic collection of Malaysian artwork, BAZAAR observes the transnational nature of contemporary art, as seen from the strokes that speak of cultural identities. Kayu Bertimbau and Bali Kelikut are a pair of sculptures by Anniketyni Madian from her 2017 solo exhibition ‘Bejampong’. 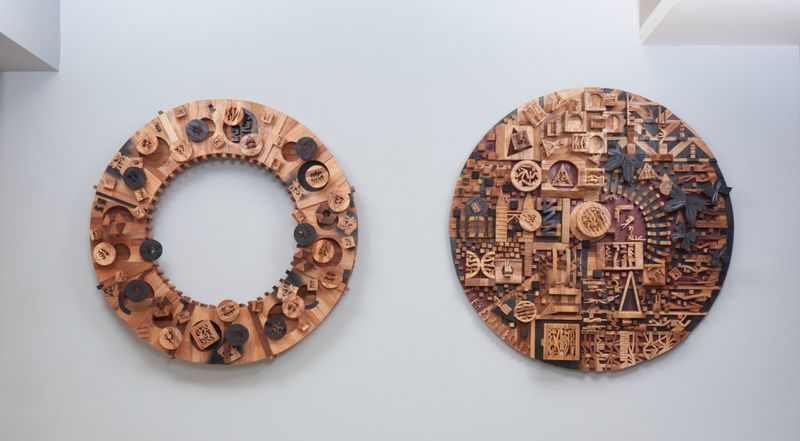 Six feet in diameter each, these wooden wall sculptures act as a survey of her career to date. Filled with subtle nuances of material exploration into different genus of Malaysian wood, they bring together several key elements from the sculptor’s practice: graphic pua kumbu patterns, butterflies poised mid-flight, geometric shapes–in new compositions and colour palettes of wood, plum, and charcoal. Commentary on the evolving role of craft traditions and unique insights into the Iban community from Anniketyni’s native Sarawak are conceptually woven through the pair, which, visually, work beautifully together. “On first sight, we were struck by Anniketyni’s contemporising of cultural artefacts. Her ability to bring a heritage pattern into a contemporary environment opens up Malaysian traditions to younger audiences, and speaks to the pivotal role the new generation plays in Malaysia, seen in our country’s current political, economic, and social situation,” the couple says. As such these dynamic sculptures speak to the very heart of Aliya and Farouk’s collecting intentions–to create a collection of Malaysian contemporary art that acts not only as a narrative of Malaysia’s art canon, but also as a resource through which the country’s history and contemporary situation can be read.